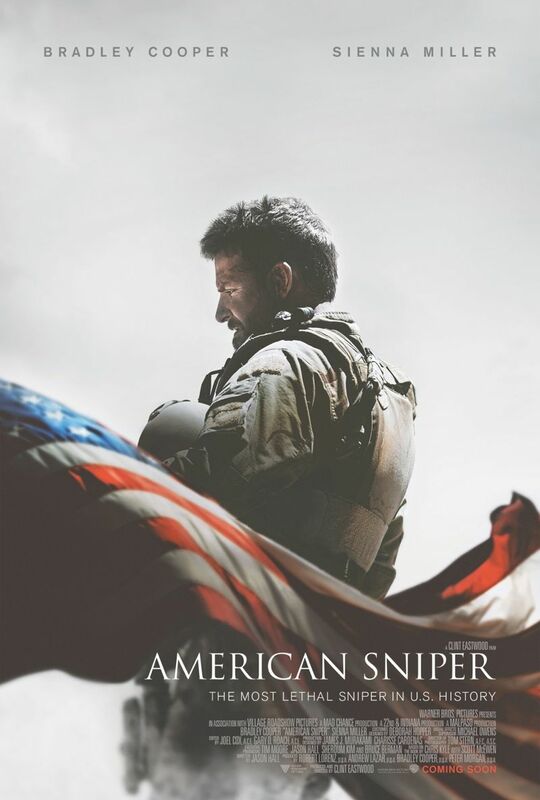 Clint Eastwood’s latest movie American Sniper is based on the true story of Navy SEAL sniper Chris Kyle who was called “the most lethal sniper in the U.S.”. Every time I watch a movie based on a true story I find it difficult to write about because ultimately I have to write about two things: the movie as such and the story it’s based on. Very often I like the movie a great deal but I’m highly critical of the story. Like in this case. I admire Eastwood for the way he tells Chris Kyle’s story but I’m not sure I can admire someone who killed so many people, although I admire his skills. The movie starts in Iraq. We get to witness two of Kyle’s most problematic kills. A boy and a woman. There is never a doubt— they are not collateral damage. Kyle takes them out on purpose. With good reason as they were about to blow up a tank. Nonetheless these two kills are problematic for him as we can easily deduce. After these initial scenes, the movie switches back and we see a few scenes from Kyle’s childhood. How he was a great shot as a small boy already, taking out a deer. This seems to be a typical sniper movie feature. I can’t remember one in which we don’t see a small boy killing an animal, which already shows he’ll be a gifted sniper. Kyle first works as a cowboy but it doesn’t work out for him and, being a patriot, he finally joins the Navy SEALs and becomes a sniper. One evening he meets his future wife Taya; shortly after their marriage, right after 9/11, he’s sent on his first tour to Iraq. The movie then tells us chronologically all the important things that happened during the tours and the growing unease when he’s back home. Kyle is quickly turning into a legend. The most deadly sniper the US ever had and he’s also a wanted man. The Iraqis will pay a great deal of money to the person who can kill him. Back home, Kyle tries to “return” but he fails. He never seems to leave the war zone. He keeps on hearing gunfire; he almost kills his own dog, thinking he’s attacking his kid; he’s withdrawn and distracted. His wife suffers but stands by him. In the movie we’re led to belive she has no idea her husband has taken so many lives. There’s even a scene in which she asks him if he’s ever killed someone. The parts in Iraq are gripping. Especially since we have a “Enemy at the Gates”-situation. There’s an Iraqi sniper who is almost as good as Chris Kyle and the two try to take each other out. I’m not sure whether it’s based on a true story as well or whether this was added/embellished for dramatic purposes. In any case, it works because it gives the movie a plotline that is suspenseful. As I said, I admire Eastwood for the way he told this story because it never felt manipulative. I didn’t think he was glorifying Chris Kyle or condemning him and whoever watches this will be able to make up his/her own mind. Since I’m not American I wasn’t all that familiar with his story. I knew the name and that he wrote an autobiography called “American Sniper”. While watching the movie I had no idea how it would end, that’s why I’m not mentioning it here. If you don’t know yet, let me just tell you that it’s a pretty ironic and surprising ending. One aspect that I found extremely interesting is what the film says about killing. Or rather – how we get to experience different ways of killing. If you shoot randomly in a battle and kill people, it’s clearly not the same as when you aim carefully and see them fall. A sniper’s kills are much more personal. I could image they weigh more heavily on the conscience than when you’re not exactly sure whether or not you killed someone. In a war like the war in Iraq there’s also the huge problem of civilians taking part. No matter how hardened a sniper is, it will be difficult for him to shoot a kid.